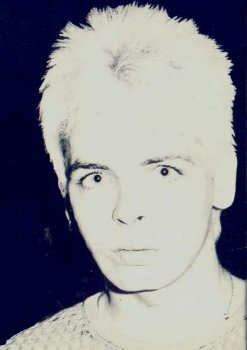 Birthday of Gary Numan (Webb) of the soon come Lasers, Tubeway Army in Hammersmith, London in 1958. "I'm becoming very familiar with the Roxy's toilets, since I spend a lot of time in them, either shagging young punkettes or shooting up whatever I can get my hands on - usually speed, but when the Banshees play I can afford smack". "A guy called Steven Taylor did this cover. Instead of drawing with a pen, he'd use an ink dropper or a broken quill and scribble with that and get ink all over the place, he didn't want a firm control over the ink. Mary Harron's (now a film director whose fillms include American Psycho) interview was astounding. It's the only time I've ever heard Johnny Rotten talk candidly, he's sincere about everything"
PUNK Magazine founded in 1976 -79 and based in New York with bold illustrations and handwritten articles ignited the punk fanzine scene.